Some feel the president has not been tough enough on our northern neighbour’s government. 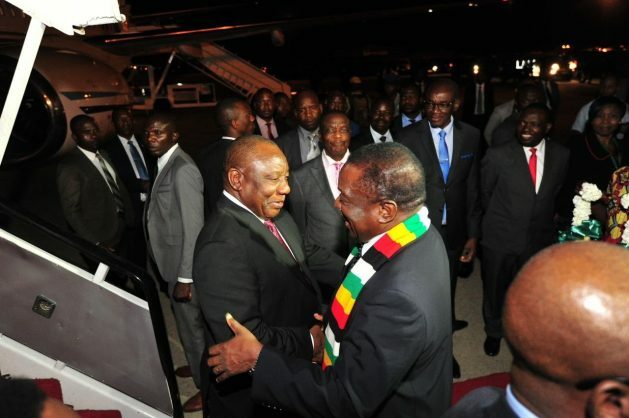 President Cyril Ramaphosa is currently in Zimbabwe, for the third session of the Binational Commission, which aims to strengthen the relationship between South African and its northern neighbour. In his opening remarks, Ramaphosa expressed gratitude for the role Zimbabwe played in supporting the liberation struggle and noted that he made calls for the country’s sanctions to be lifted, which were heeded by the European Union. The speech can be read in full here. Much of the speech saw the president committing to support Zimbabwe, which is currently struggling through a severe economic crisis. “South Africa stands ready to render support to Zimbabwe within our means in your quest for economic renewal,” Ramaphosa said. Ramaphosa said his calls for sanctions to be lifted was “the first of many steps needed to support Zimbabwe’s recovery”. The president mentioned that his country was also battling economically. “As South Africa, we are also emerging from a difficult period, not only of poor economic performance, but also of diminishing public trust in state institutions and low investor confidence,” he said. “We have been forthright in acknowledging the effects of decline of governance, corruption and what we describe as ‘state capture’ on our economy, our institutions and our people,” he added, before listing some of the steps he has taken to move South Africa towards growth. Some feel that Ramaphosa has been too diplomatic, and not tough enough in his policy towards Zimbabwe, particularly following a brutal crackdown against protesters following a massive fuel hike which saw the price more than double, adding to Zimbabwean’s already considerable financial woes. At least twelve people died and hundreds were injured by security forces. The Citizen reflected this in an article by the University of Witwatersrand’s Professor of Sociology Roger Southall. “In South Africa, demands that President Cyril Ramaphosa’s government should take firm action are fuelled by two factors. The presence of a large Zimbabwean migrant community within the country is one. The second is a widespread sense that Pretoria’s policy towards its errant neighbour has always been one of light wrist-tapping rather than a vigorous twisting of arms,” Southall wrote. The leader of the official opposition, the DA’s Mmusi Maimane, has also been vocal about what he saw as a lack of decisive action from the president. “Assault, torture, inhumane and degrading treatment of citizens continues while President Cyril Ramaphosa sits on his hands and refuses to take action,” Maimane said recently, speaking outside the Zimbabwean embassy in Pretoria ahead of a visit to the country, where he dropped off a letter requesting a meeting with Zimbabwean President Emmerson Mnangagwa. “Their stories tell the harrowing truth as to what happens when a government turns on its own people, using military force and violence to suppress protest and opposition. The letter requesting a meeting claimed that there was an absence of leadership from the South African government, even after the DA approached Ramaphosa, requesting he advise the nation on what the next steps the government would take to ensure an end to the violence. “In the absence of any meaningful intervention by either the South African government or regional African bodies such as SADC and the AU, I have no choice but to intervene in an effort to help find a peaceful resolution,” Maimane said.